Several problems I see here. Avoid RV salespeople as most have never lived in an RV and don't know about weights etc. I didn't know what an RV was when my DH suggested it 8 years ago, now I'll never go back to a house. Avoid anything light...it won't handle the rock and rolling of fulltime plus they can't handle any inclement weather. Travelling a couple of hours for an RV show will get you used to the travel needed to see this great USA. I'd also suggest you keep a notebook of all of your DR visits, medication etc. If you need A Dr. on the road, you'll have everything you need at your fingertips. Every RV has tradeoffs so your 3 MUST HAVEs have already been identified, go for them. I usually suggest 36-38' is ideal for fulltime but that doesn't mean you can't do it smaller. This forum is all I had to help me once we decided to go fulltime. Happy shopping. You'll LOVE the freedom. Before we went fulltime 6+ years ago, there was no FB or RV trader...only the forums from Escapees. They gave me every bit of knowledge I asked about and then some. Great exchange here. First I'd suggest you stay away from a light anything! They are not made for the rock and rolling of fulltime life plus if you'll always be in good weather (NOT!) they are not made for inclement weather. Having fulltme for 6+ years in a 34, 38 & 42' RV, I'm convinced a 36-38 is enough for fulltime for 2 people, smaller if solo. List 3 must haves...every RV has tradeoffs. Happy shopping. My 2 cents - make a list of 3 things each of you Must haves and a few Nice to have. There will be tradeoffs on every RV even though there are thousands. We've fulltimed in a 34, 38 & 42' and I'm convinced 36-38 is enough to fulltime in...trailer or 5th wheel. 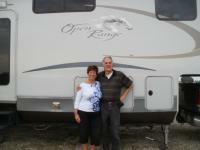 We now live in a 42' fifth wheel and travel in a 38'tt and there is more storage and seating in our tt. Don't let money determine your happiness. Do what works for YOU...that's the best you can do. I agree your first RV won't be your last RV. Enjoy the journey. I firmly believe talking with people is more important than any thing we think we need to do. Its a lost art. New RV - let's have some FUN here!!! We've been fulltime for 6+ years and a few years ago we took our 42' toy hauler to Colorado. I decided we needed 2 days to go to the west side of the Rockies, so we threw in a tent and sleeping bag. Saw millions of stars, elk, moose, an eagle, we were quite happy when we went to bed. For 5 minutes...we tossed and turned and finally I said "I cant do this". My DH immediately packed up our clothes, said OK and we promptly travelled to Grand Lake for a hotel! our plan was later we would do Montana et al with the 42 TH and camp on side trips...the ground has gotten so much harder! So when we sold our 1st RV that was for sale for 2 years while we travelled, we went shopping for a tt to actually travel in as we were headed to the east coast. I wanted to like a 24' one, but got Claustrophobic in one. So we bought what we thought was 32' from the 3200 on the label even though it looked awfully big for a 32'. So 1 1/2 years later I convinces DH to measure it...it was 38'!! We just laughed. So now we live in a 42' TH and travel in a 38'TH. Is 38 ft to long to bumper pull? We bought what we thought was a 32' tt due to the 3200 on the label. We finally measured it and it was 38'.... We now live in a 42' toy hauler and travel in a 38' tt, triple axle and pull it with a 2014 F250 with air bags and the truck doesn't know its behind it. We have more sitting space and storage in the tt than in the fiver. You can definitely fulltime in it...I cook and quilt in mine and hubby works if he needs to. We are looking at the Montana with the front kitchen. We owned a Montana when we first went fulltime 4+ years ago it we no longer want/need the toy hauler we have. It scares me since Thor bought them...anyxnreassurance out there? As I read the other statements, ours is different. We never camped or even went into an RV. I didn't even know that an RV was! On our way back from Atlanta for Thanksgiving where one of our son's lived my husband mentioned retiring. I said I wasn't spending 1 more winter in OH when he retired...I hate being cold. He was thinking of a 5th wheel...what's a 5th wheel? That January, there was an RV show in our hometown and as I walked into a Montana I saw new cabinets, real dresser and a real table. This my Dad told me to live light and I married a "collector", I saw this as a chance to live light. PLUS, our kids moved and took our then 6, now 9 grandchildren with them AND my husband had a scare of cancer...it became a no brainer. I decided I didn't want storage, or to pull anything, so a 5th wheel and a truck were purchased, we sold the house and everything in it 3 + years ago and neither of us regret 1 mile. It takes me 20 minutes to clean the RV and then I'm free to play. I don't need to ever have a house again!! There's nothing I can't do in my RV that I did in the SB, just with a lighter heart. And Escapees helped us immeasurably changing our domicile from OH to TX in 2012. We couldn't had it so smooth without them! Same for Florida and SD since they now have mailing advantages for all 3 states. Is it only the Keystone or Montana RV's that have the decals curl up? My parents lived here for 30 years and always had a place in Show Low or Pinetop. There's BLM land up there too. We plan on finding a place there when we can't drive anymore. We'll settle in PHX but summer in Show Lo...we have friends there now!